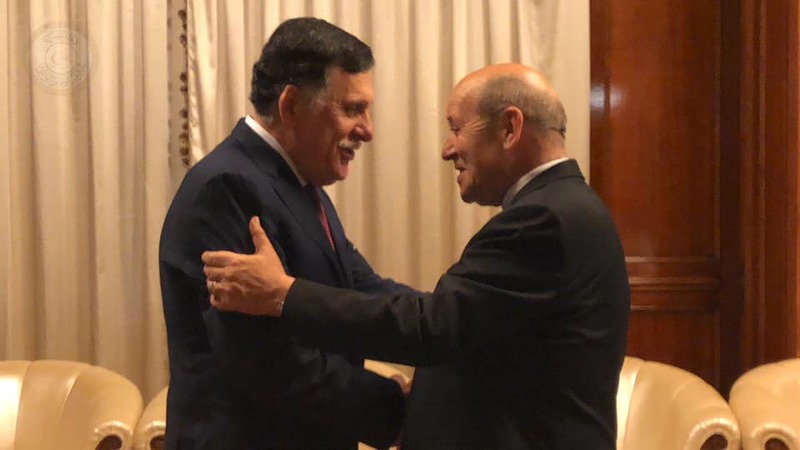 French Foreign Minister Jean-Yves Le Drian reiterated during his meeting with Chairman of the Presidential Council (PC), Fayez Al-Sarraj in Tripoli on Monday his country's support for political solutions and for the UN envoy Ghassan Salame’s action plan, saying there is no military solution to the Libyan crisis. Le Drian reaffirmed his government's pledge to work on consolidating the state institutions and to pave the way for holding presidential and parliamentary elections by the end of this year, as stated in the Paris agreement in May last year. The meeting also covered developments in Libya's political situation, bilateral relations, and issues of common concern, according to the PC Information Office. For his part, Al-Sarraj said that his recent consultative meeting with Haftar in Abu Dhabi comes within the framework of his wide-ranging talks with all Libyan parties to seek solutions to the current crisis, and to find consensus proposals that can be built upon during the National Conference, expressing hope that the negative interference of some countries, which have prolonged the crisis, would be stopped.